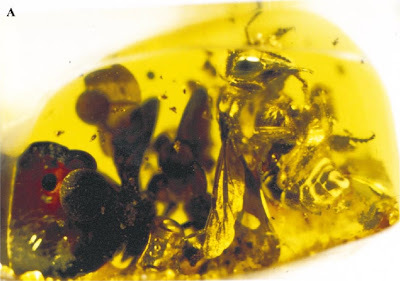 Specimen of Protobombus indecisus in Baltic amber, from Engel (2001). The Electrapini are an extinct group of bees, similar to modern bumblebees, known from the Eocene of Europe. Characters (from Engel 2001): Moderately sized (ca. 5.5–16 mm long), robust, densely pubescent bees. Mandible with weakened outer mandibular grooves. Labral width 2–3 times length. Clypeus slightly convex and weakly protuberant in lateral view or flat (in Thaumastobombus). Compound eyes bare or with sparse, microscopic setae. Supra-alar carina present; scutellum broadly rounded posteriorly and variously produced (ranging from projecting over metanotum and propodeum to over metanotum only). Claws of female with inner tooth; arolium strong and present; single, reduced metatibial spur present; malus of strigilis with short, thickened anterior prong in addition to primary ventral velum; metabasitarsus with distinct auricle at base; metatibia without penicillum. Distal venation of forewing strong and present; marginal cell large and narrowly rounded at apex, slightly offset from wing margin, truncate or feebly appendiculate, cell longer than distance from its apex to wing apex; pterostigma present and short to moderately sized, much longer than prestigma, r-rs arising near to just after midpoint, margin within marginal cell variously produced; 1m-cu relatively straight; hind wing with distinct jugal lobe, lobe broadly and deeply incised; hamuli numerous or reduced (numerous in Electrapis and Protobombus, reduced in Thaumastobombus); wing membrane without alar papillae. Sting not reduced; with or without microscopic barbs. [WE03] Wappler, T., & M. S. Engel. 2003. The Middle Eocene bee faunas of Eckfeld and Messel, Germany (Hymenoptera: Apoidea). 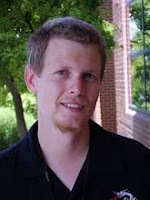 Journal of Paleontology 77 (5): 908-921.